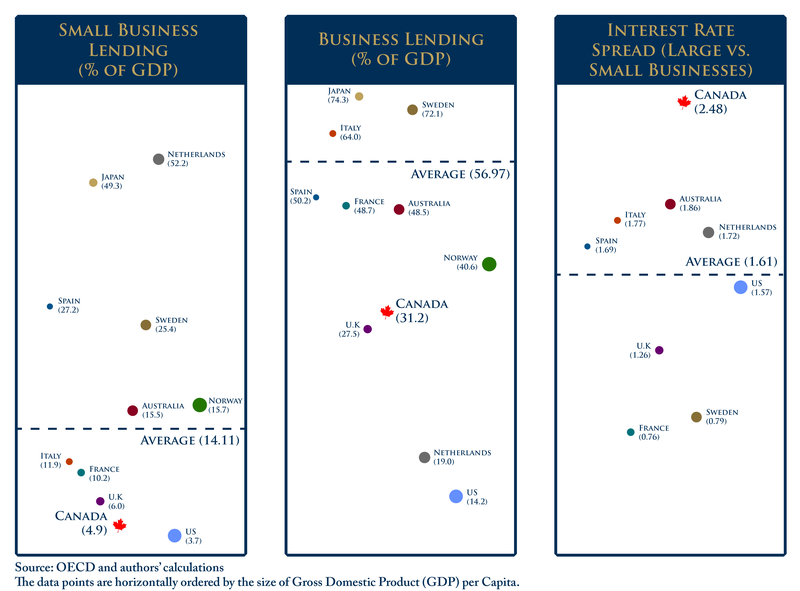 In this edition of Graphic Intelligence, we compare Canada’s business lending behavior to that of other OECD countries. Canada ranks near the bottom in both overall business lending and lending to small businesses (percent of outstanding loans) as a percentage of GDP. Canada also ranks at the bottom with the largest spread between the interest rate for loans to SMEs and those offered to large firms. Improving the financial sector’s productivity would boost not only the sector’s performance but also the economy as a whole. In the graph above, different sizes indicate the differences in GDP of the corresponding countries. To learn more about allocation of capital, and the two other areas that hinder Canada’s productivity, read “Productivity and the Financial Sector – What’s missing?” by Jeremy Kronick.